Says such acts by AP government have been costing TS over Rs 6,000 crore a year. File photo of Minister T Harish Rao. Hyderabad: Andhra Pradesh government systematically price-gouged Telangana on power supply front and also resorted to grabbing a hydel power station. Along the way, it steadfastly refused to accept 1,153 staff from Andhra Pradesh, working in Telangana, causing further financial hardship to Telangana power sector utilities. All put, these acts of the AP government led by TDP president N Chandrababu Naidu have been costing Telangana upwards of Rs 6,000 crore a year, Minister T Harish Rao revealed at a press conference here on Thursday. He said when Naidu managed to get overnight orders for merging 7 mandals affected by Polavaram project in AP even before the Telangana government settled in, that State did so with the full knowledge that the highly productive 460 MW Sileru hydel project located in the area it grabbed, would also go to AP. With 60 per cent plant load factor, Sileru was a reliable and inexpensive source of power throughout the year. Just by this act, AP government caused a loss of Rs 500 crore annually in lost inexpensive power production to Telangana, Harish Rao said. During the first year of Telangana’s existence, AP refused to give Telangana its share of 53.89 per cent of power it produced as laid down in the AP Reorganization Act, 2014. It did so by unilaterally cancelling power purchase agreements entered into with Telangana by AP Genco, Hinduja, Krishnapatnam and hydel plans in AP which resulted in Telangana not getting 2,465 MW of electricity each year. This had resulted in an additional expenditure of Rs 4,557 crore for Telangana in power purchase costs from the open market, he said. 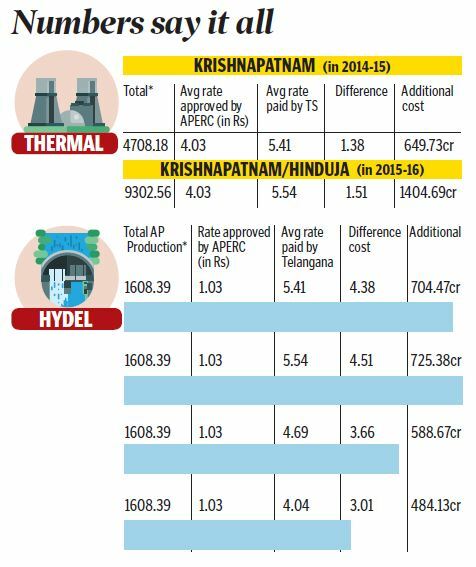 Had AP honoured its commitments as provided in the Act, Telangana would have received hydel power at Rs 1.03 per unit and thermal power at Rs 4 per unit. However, by being forced to buy power in the open market, Telangana ended up paying up to Rs 5.54 per unit. “Is this nothing but stabbing a newborn State right in its heart?” Harish Rao asked. He further said that while saying AP had no power to supply Telangana, it did participate in open tender invitation and then mysteriously found enough electricity to sell to Telangana at Rs 5.35 per unit. He also said by not accepting 1,153 power sector employees allocated to AP, that state forced Telangana power utilities to carry additional wage burden of Rs 15 crore a year so far. Empty office spaces, sometimes entire floors in government-owned buildings in Hyderabad, are literally rotting away with the Andhra Pradesh government preferring to keep them locked instead of handing them over to Telangana and letting the offices be put to good use. 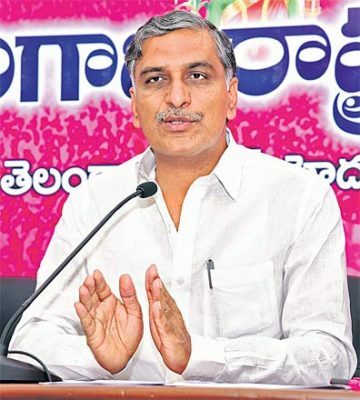 Many buildings and offices allotted to AP as part of the Reorganisation Act have been under lock and key, empty and desolate and in the absence of any use and maintenance, are literally rotting away, Minister T Harish Rao said on Thursday. He told reporters that for instance, the Legislative Assembly building, several rooms and other office spaces were allotted to AP as part of the Act. “But AP is no longer using these spaces. Similarly, in Boorgula Ramakrishna Rao Bhavan near Tank Bund, Telangana government offices are being forced to store files in corridors as AP does not want to hand them over the spaces it has vacated from,” he said. There were three meetings of ministers’ committees from both States on this issue that were facilitated by the Governor. But AP refuses to hand them over to Telangana. “It is clear that AP would rather have valuable structures go to rot than be put to use,” he said. In some of these spaces pigeons have begun to roost, he added. Harish Rao also accused the TDP-led AP government of greed in demanding a share in the old Nizam era properties. They belong to Telangana as they were constructed before formation of undivided Andhra Pradesh, he said. Irrigation Minister T Harish Rao on Thursday said TDP president and AP Chief Minister N Chandrababu Naidu was single-handedly responsible for every attempt AP made to obstruct Telangana from completing pending irrigation projects, taking up new ones, and making attempts to rob Telangana of its rightful share of river waters. Addressing a press conference at Telangana Bhavan here, Harish Rao said Telangana’s rightful share of water from Godavari and Krishna rivers was 1,330 tmc. “This allocation was something that was decided during the undivided Andhra Pradesh era,” he said. He was speaking after releasing an open letter to Naidu with 19 questions. He said the questions point to the very core of TDP and Naidu’s behaviour towards Telangana from day one –attempt to undermine the new State. “Is it not true that you (Naidu) opposed the Palamuru-Ranga Reddy, Dindi, Kaleshwaram, Sitarama, Bhakta Ramadasu, Tummilla and several other projects? Is it not true that you and your administration have written several letters to the Central government as part of a conspiracy to stop these projects,” Harish Rao asked. The TRS leader also reminded Naidu of his pre-2014 election promise to construct Palamuru-Ranga Reddy project. Despite this being the case, Naidu has been claiming that the project was illegal. Even the now Prime Minister Narendra Modi, at a pre-poll public meeting in Mahbubnagar promised to construct the project. Despite this the TDP president and his government have been writing letter upon letter opposing this and Dindi projects, Harish Rao said. Harish Rao wondered if Naidu and leaders from his party, the TDP, when they go to campaign for the coming elections in the State, will explain to the people that their party had written letters, opposed irrigation projects in Telangana and then seek votes from people on this basis. Harish also asked Naidu why the TDP government in AP, which was dead set against Telangana’s irrigation projects, taken up Purushottampatnam, Guru Raghavendra, Pulikanuma, Siddapuram, Sivabhashyam lift irrigation schemes as well as Pattiseema, Machumarri, Gandrevula, Gajuladinne, Munneru and the Godavari-Penna link scheme to take 40 TMC of water to the Penna Ahobilam balancing reservoir project without any permissions. “Your government has not even sent detailed project reports on these to Telangana Government, as well as to the Krishna and Godavari River Management Boards,” Harish Rao said quoting from his open letter to Naidu. “Everything I have mentioned is supported by documentary evidence. You (Naidu) must answer to the people of Telangana on these 19 questions I have asked in the letter,” Harish Rao said. He also released supporting documents including copies of the letters written by Naidu and AP government to the Centre seeking stoppage of irrigation projects in Telangana. 1 – Did you not conspire to obstruct irrigation projects in Telangana? 2 – Did you not promise in the run up to 2014 polls to construct Palamuru irrigation project? 3 – Was ‘spilling poison’ on Kaleshwaram project not a part of your devious plans? 4 – Is giving water to Paleru a sin? 5 – Did you not say no to Tummilla only to get water for KC Canal? 6 – Is it not true that you are conspiring to undermine Kalwakurthy project? 7 – Did you not indulge in a drama to prevent Telangana getting Krishna water in lieu of Polavaram project in AP? 8 – Was it not part of your ‘scheming’ to object to Telangana getting its share of water from Srisailam? 10 – Was not grabbing 7 Polavaram-affected mandals from Telangana your first injustice to TS? 11 – Did Telangana not lose Rs 500 crore a year because you grabbed 7 mandals that included Sileru hydel project? 12 – Have you not adopted a cruel attitude with regard to power supply to Telangana? 13 – Were PPAs not cancelled just to deny Telangana 2,465 MW power? 14 – Were you not responsible for Telangana spending Rs 4,557 crore to buy power at higher costs? 15 – Instead of giving allocated power, did AP not take part in open tenders for power supply to Telangana? 16 – Has a burden of Rs 1,000 crore not been placed on Telangana by not taking power sector employees allocated to AP? 17 – Wasn’t it mean-minded of you not to hand over vacant office spaces to Telangana? 18 – Isn’t it greed on your part to seek share in assets and properties in Hyderabad from the times of Nizams?